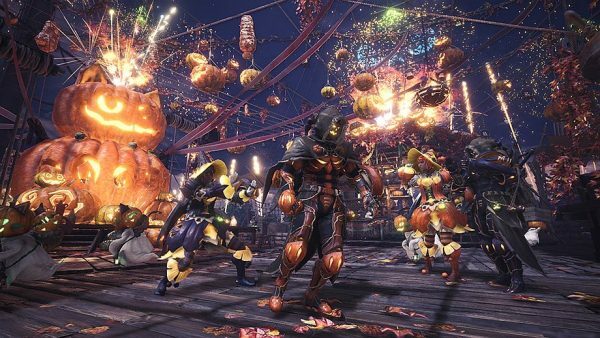 The Autumn Harvest Fest is live in Monster Hunter World, and it features Halloween-themed gear and items. Monster Hunter World players will find the Celestial Pursuit decked out with Halloween-themed decor, and it looks super festive. During the festivities, players, their Poogie and the Handler will also have special costumes.Daily login bonuses, limited bounties and more will feature some “special surprises,” along with a chance to earn Autumn Harvest Fest gear. You can check out the new gear through here. Seasonal platters will be present in the Gathering Hub, and items or services at all facilities will be available at reduced costs. For the duration of the event, almost all previously released event quests, including exclusive Autumn Harvest Fest quests, will be made available. There are also two, new event quests available. New Event quest A Royal Pain unlocks a Mosswine Mask and Faux Felyne layered armor pieces. In order to acquire these, players must fight a Rathian and a Pink Rathian at the same time. Also of note: the second part of the Universal Studios Japan quest will go live, allowing players to earn the Azure Starlord Armor set. It is a set worth obtaining, as Arekkz explains in his latest video. The Monster Hunter World Autumn Harvest Fest will run through October 4. The post Monster Hunter World’s Autumn Harvest Fest has kicked off appeared first on VG247.